I… generally don’t go on dates. It isn’t that I don’t want to, but it just rarely happens, I’m that fun combination of picky and shy and honestly fed up with modern “however people meet people” methods and technology. I understand those who may not want to leave their house and go to bars, or think that bars and clubs are just for hookups. And I realize that the dating sites and apps are supposed to bridge that gap… but they’re truly awful. You spend time flicking through face after face and profile after profile. You send a message that doesn’t necessarily get a response right away, but then does seem to get a response when you’re in the middle of something else. Gods forbid that something else is also an activity on your phone, so you have to keep switching back to an app that needs to reopen itself, show you the same ads over and over again, just so you can type back 5-10 words and start the process all over again. But I digress. I was feeling myself a bit after a weight loss goal and getting good news from my oncologist and thinking, “I dunno, maybe a date would be nice!” I actually am a believer in the idea that dating is to meet new people and find out what you do and don’t like. It’s only the crap shoot aspect of it that feels annoying. Why get all dolled up to spend time with someone you’ll maybe never want to hear from again? I get it. Still, I was willing to try. A few taps on “Woof!” or “Would Like to Meet”, a few swipes to the right, a few taps on profiles just to be like, “Hey, I looked at you. Maybe you should look at me?” You know, the usual. Cast out a lot of lines, got some nibbles back. 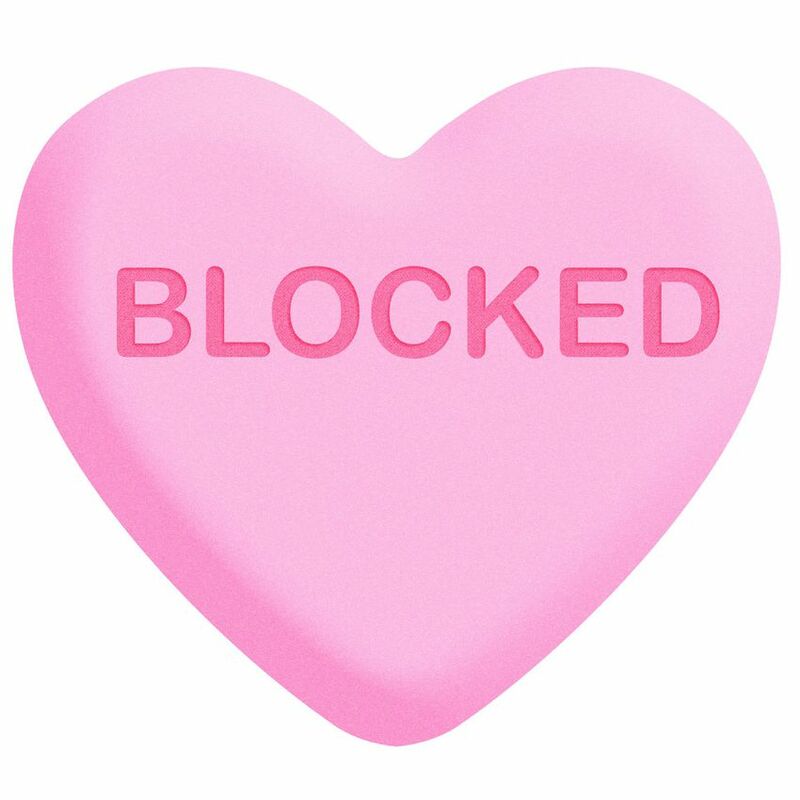 This guy I’m pretty sure I’d chatted with before — in a very polite and chaste manner — hit me up again late January with a more serious “What are you looking for?” and I gave my best answer which usually amounts to some variation on “dates, friends, casual”. His response to same was a bit more aspirational, very relationship-oriented. And I’ll be honest, this is where I should have run. It continued with the usual banter, who are you, what are you all about, how do you spend your free time, etc. for a few days. 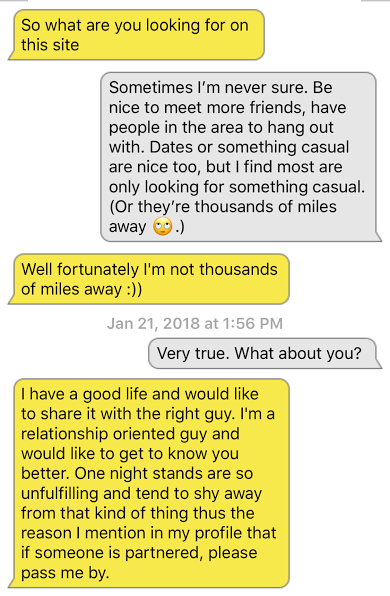 Very general “getting to know you” stuff, and then he asked me out on an actual date the following weekend: a movie and then dinner. Now… I’ll be honest, that’s a lot. I know dinner and a movie is a traditional date, but in my opinion, that is too long to spend with someone you just met. That’s at least 4 hours, half of it you’re trying to be on best behavior with food and conversation, and the other half of it you’re sitting in the dark with zero conversation. I really prefer shorter meet ups with an option for a later engagement. Grab coffee or drinks, see a small exhibit, something that’s around an hour or so with the understanding that there’s no obligation to keep going after that time is up. Even so, I accepted as he hadn’t really tripped any alerts and seemed like a nice enough guy. There was some chat around fleshing out the details and it was around then that things started to feel a bit off. I can’t say whether both of the jokes bombed or were misunderstood, but each one definitely set something off. The former generated comments about past guys taking advantage of his generosity in the past, and he already started making comments like “If you want to back out…” Again: red flags. But it was the latter that truly set him off. In a normal city sense, nothing in the DC/MD/VA area is “far” but as a city resident, without a car, it’s not easy to get everywhere and certainly not quickly. I have friends who live in the burbs who also make jokes about it being “The Hinterlands” and similar. I clarified that I was joking, I even reminded him that earlier in our conversation I said I’d been out that way a few times before for Small Press Expo, but it was too late for any of that. Too much drama. Sorry. Hope you find another guy. Enjoy your movie. At this point, I will admit that had we been talking on the phone by this time, there probably wouldn’t have been such an issue. He might have heard my comments in context. I might have heard his reactions to my jokes. On the other hand, we might not have made it this far at all. As I wasn’t about to prostrate myself to try and fix or deal with whatever was going on, I just wished him a nice weekend, said it had been nice talking to him and assumed that was that. At least I gave it a shot, it didn’t work out. Ok.
All this time, I wasn’t responding, and after that last message, I took some “No one’s ever gonna believe this,” screenshots and blocked him. And I ended up being annoyed, not because I didn’t spend about 4 hours with someone who I might have set off with a stray comment or joke at any moment, but because as a result I didn’t have any Saturday night plans! I realize people aren’t easy, dating isn’t easy, relationships are hard, but ye gods it’s experiences like this that make me not even want to bother trying. And I have gone on a date or two since, and they haven’t really developed into anything, and that’s fine. I guess from a “lessons learned” perspective, I gained a lot of knowledge on what/what not to do, but for real? I’m hoping I don’t have to deal with someone like that again. I’m honestly not that hard to date. Let’s go out for some good food, let’s go out for some good drinks, let’s go out for some good dancing and we’re all set. Oh… and brunch on the weekend. I’ll call you or nudge you. Perhaps if you’d added “It’s far… but you’re worth it.” ? Then, again, maybe he’s not. Sounds like he had a lot of buttons that took no pressure at all to activate. What a tool that guy is. I mean, come on. If this is what DC has to offer you, I’m so sorry. Wish I could help.